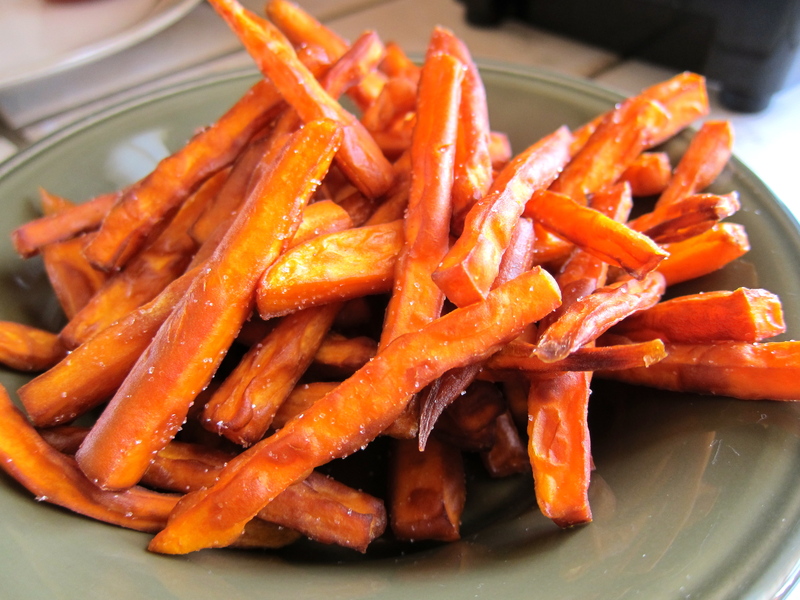 I love sweet potato fries. I don’t eat out much, well hardly at all really, and only at a handful of local restaurants. One of my favorite places to eat used to be California Cafe in Denver because they had a lovely gluten-free menu, used local and seasonal ingredients and had the best fresh, hand cut sweet potato fries, ever. It was a sad day for me when they closed! I’ve tried many different methods of cooking, frying and baking sweet potatoes to recreate the light crispy texture of those wonderful fries at California Cafe but never could get it just right…until now. 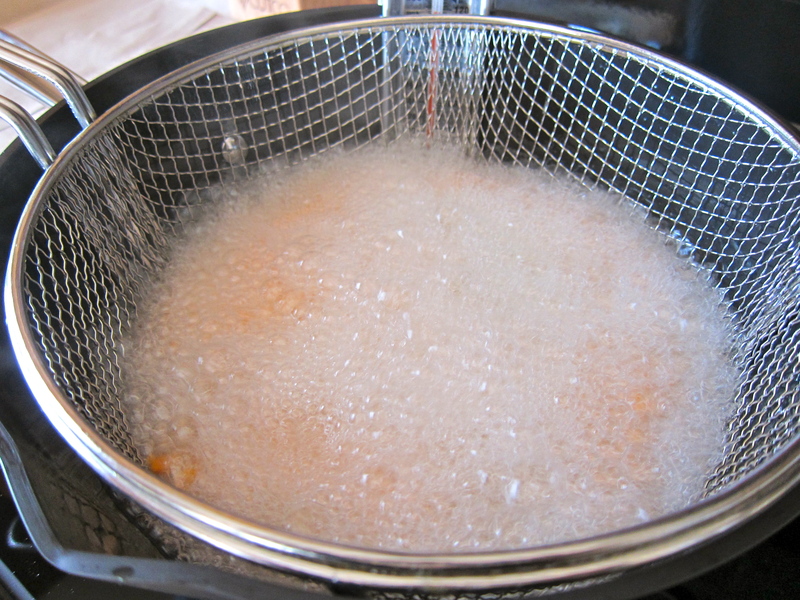 Double frying is definitely the secret to getting a crispy fry that is still light and fluffy on the inside. This is really a process but totally worth it. If you don’t have the time or the patience for frying I also have perfected the oven-baking method too and I have included the instructions for that as well! Peel and rinse the sweet potatoes. Cut each potato lengthwise into 4 or 5 pieces, then cut each piece into sticks. The thinner these are, the crispier they will be. Place the fries in a large bowl. Cover with cold water, then allow them to soak 2 or 3 hours (or you can stick them in the fridge and let them soak overnight). 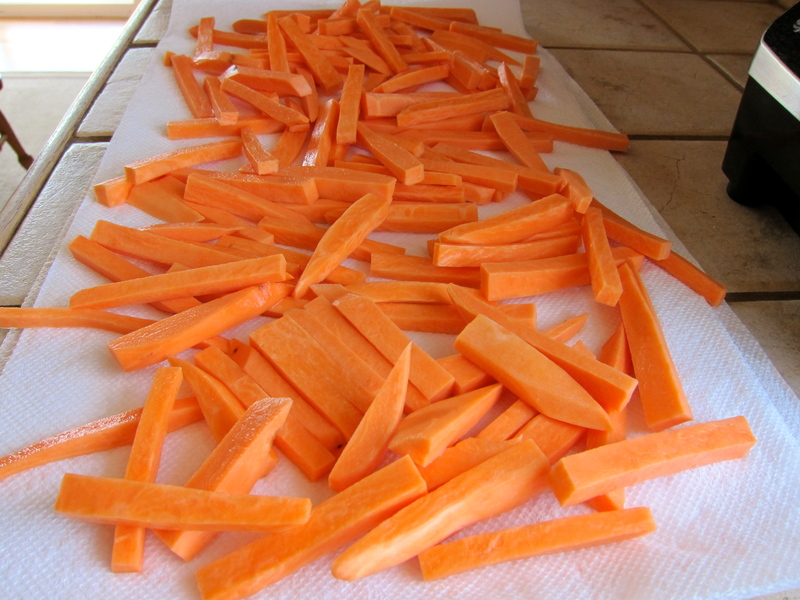 When you’re ready to make the fries, drain the water and lay the potatoes on 2 baking sheets lined with paper towels. Blot with paper towels to dry. Place the patted dry sweet potatoes into a dry bowl and sprinkle with the arrowroot powder and toss the potatoes to coat evenly. Heat a few inches of coconut oil to 300° F in a heavy pot. In 3 or 4 batches, fry the potatoes about 4 to 5 minutes per batch, or until soft. They should not be brown at all at this point-you just want to start the cooking process. Remove each batch and drain them on new, dry paper towels or a brown paper bag. Once all the potatoes have been fried at 300 degrees F, turn up the heat until the oil temperature reaches 400 degrees F. When the oil is hot, start frying the potatoes in batches again, cooking until golden and crisp. Remove from the oil and drain on fresh paper towels or a fresh brown paper bag. Sprinkle the fries with sea salt and serve with the ketchup and sour cream for dipping. Preheat the oven to 425° F. Line a baking sheet with parchment paper. Place the patted dry sweet potatoes into a dry bowl and sprinkle with the arrowroot powder and toss the potatoes to coat evenly. Once the potatoes are coated with the arrowroot, drizzle with 2 Tbsp. of melted coconut oil again tossing to coat evenly, sprinkle with sea salt. Spread the sweet potatoes onto the prepared baking sheet in a single layer making sure not to overcrowd, use two baking sheets if necessary. Bake for 45-50 minutes, turning occasionally, until the sweet potatoes are crispy and browned. Let cool on the pan for a few minutes before serving. Those look amazing! Love the idea about dipping in sour cream. At the bottom of the post is the recipe for how I bake them…I actually prefer them bakes as well. Frying is fun for something different but it’s kind of a pain of a process and I enjoy them too much to not have them every week, so baking is my preferred method! Can the first frying be done a day in advance and the second frying done next day just before serving. I have never done it before but I’ve seen Emeril do it on TV! So, it must work ;)…let me know if you try it how they turn out. What’s the arrowroot do? Make a crusting? Not really a crust but it helps them crisp up nicely. 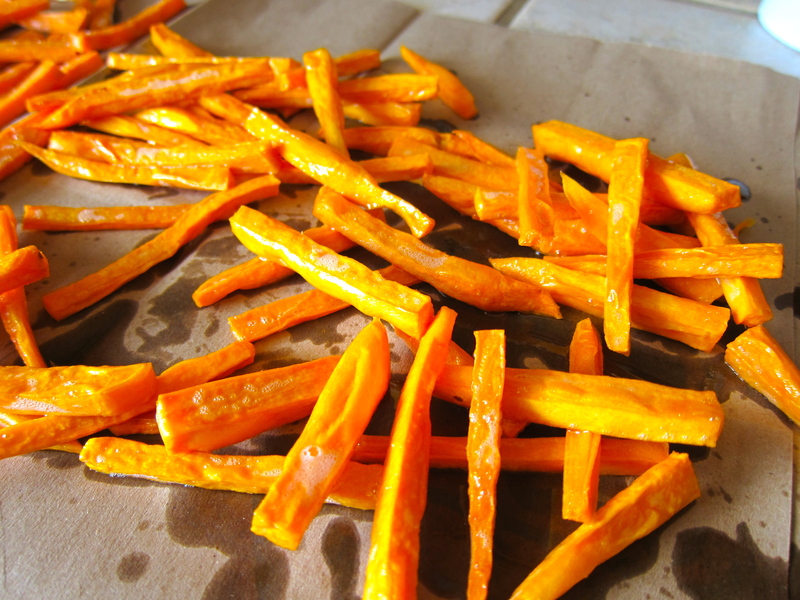 I’m on a quest for truly crispy sweet potato fries, so I’ll give your techniques a try for sure. Thanks for posting!! These will fit the bill…the arrowroot really does the trick! 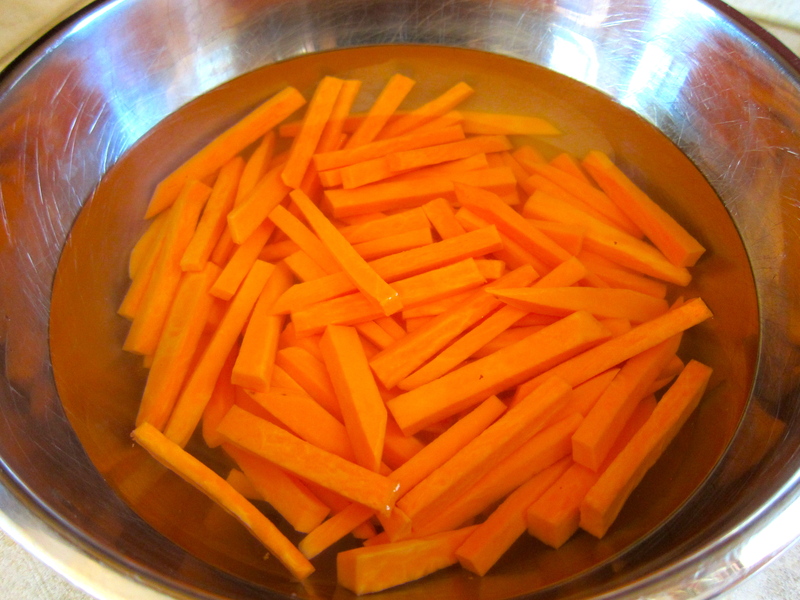 I actually prefer the baked method over the frying…much easier and a lot less mess! If you don’t have any dietary restrictions corn starch, potato starch or tapioca starch would work in place of the arrowroot. Lovely! I have 2 sweet potatoes left after making my sweet potato casserole and I was just wondering what I could use them for LOL. Now, I know 🙂 I believe I will go with the oven method so that my father can try them. He’s not allowed to have anything that is deep fried. Thank you for sharing this recipe in ‘Made From Scratch’ Monday! I hope that you will share any others that you may post this month 🙂 Have a great week! 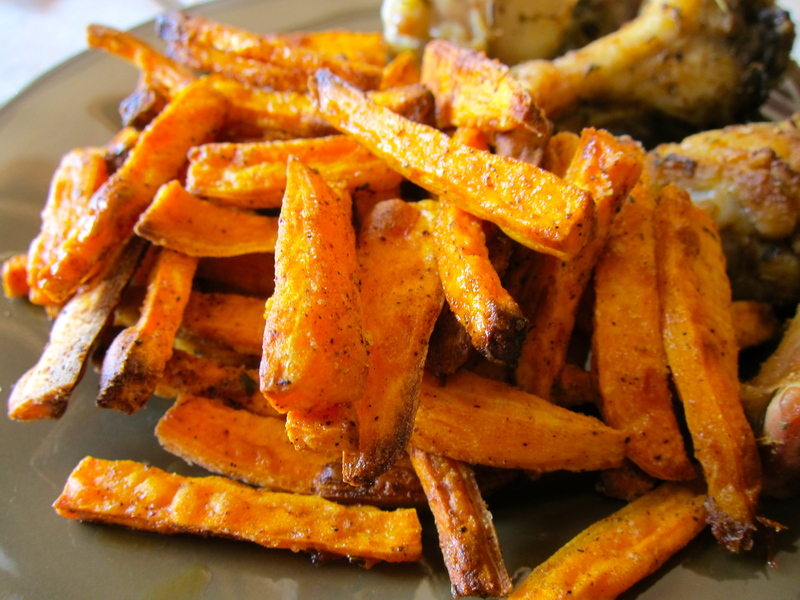 I know that sweet potato fries are much healthier esp, baked then potato fries but I’ve never made them. I will give it a try. Please bring these by my foodie friday party today. People will enjoy them. I’m wiping the drool from my chin! Those fries look totally amazing! Thanks for sharing.